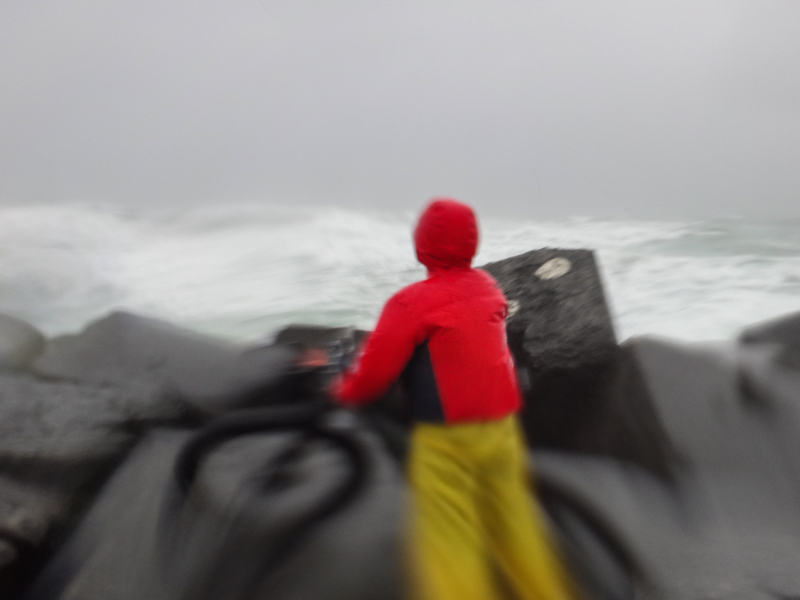 “High winds, heavy rain, rough seas.” The forecast was bleak. 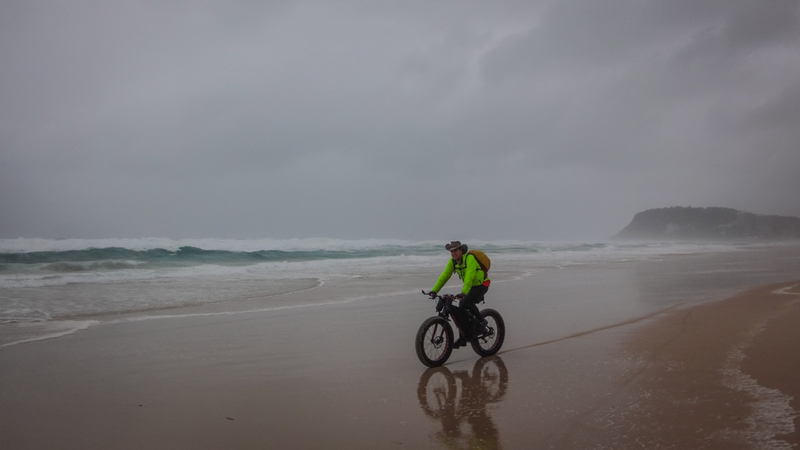 In this sort of weather we decided our best chance for a good ride was to go to the beach – away from muddy trails and fallen tree branches. 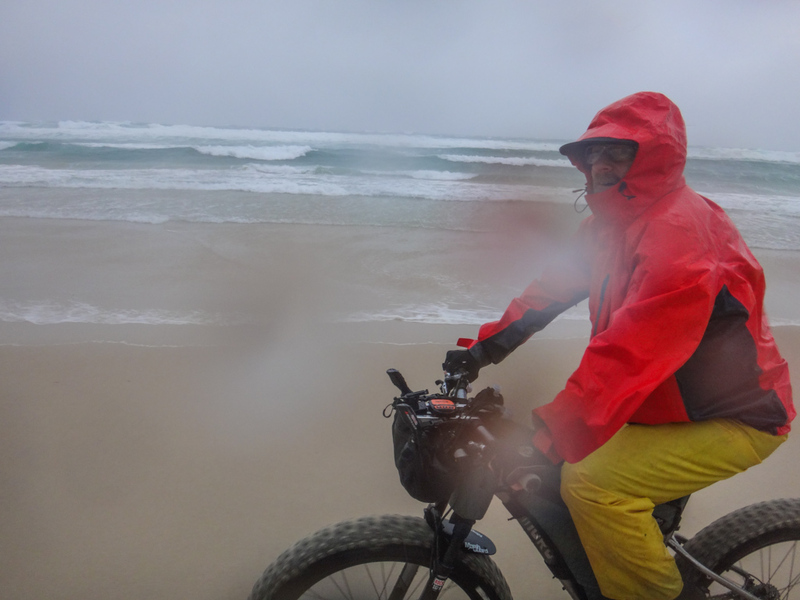 It also gave us a rare chance to see how some of our wet weather gear held up in foul weather. Darb wore a North Face Goretex rain coat, Frill-neck cap, Ground Effect Berglar jersey, mesh base layer, Ground Effect shorts, Waterproof pants and Five-Ten shoes. I wore an old canvas hat with a buff headscarf, Bellwether rain jacket, Ground Effect Berglar jersey, mesh base layer, Ground Effect knicks, Louis Garneau Leg Warmers and low-end Shimano shoes. 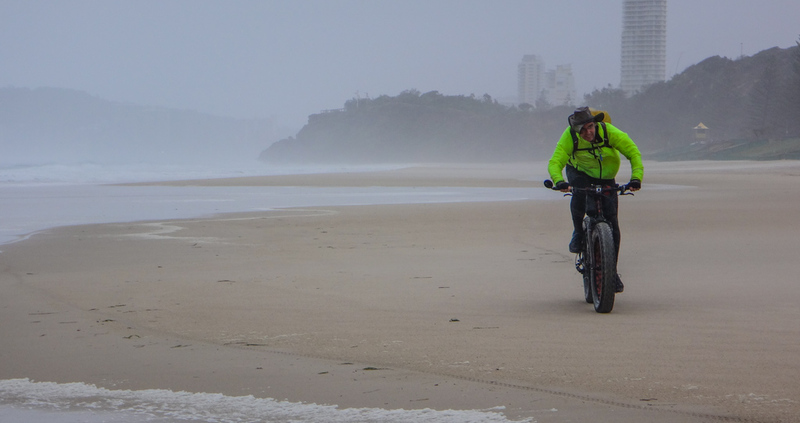 We started at Burleigh Heads intending to ride to the Gold Coast Seaway and back. Low tide was due at 1pm, which allowed us to start late in the morning, with the falling tide giving us plenty of sand on which to ride. 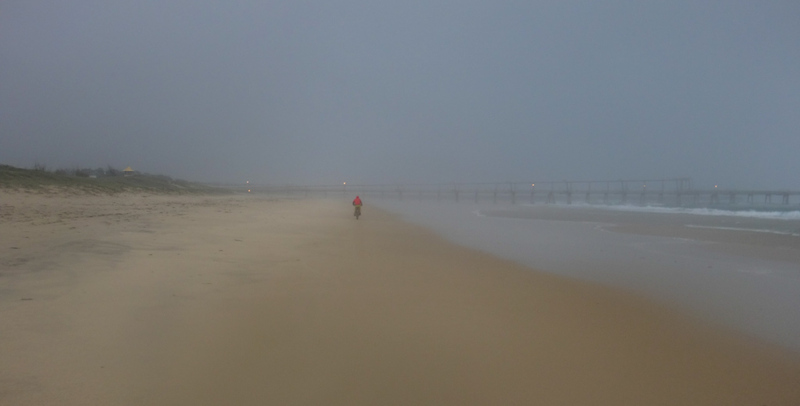 We set off into torrential rain with the wind howling down the beach at us. I had planned to just follow the sand as far north as possible, not realizing the rocky outcrop of South Nobby blocked our way. 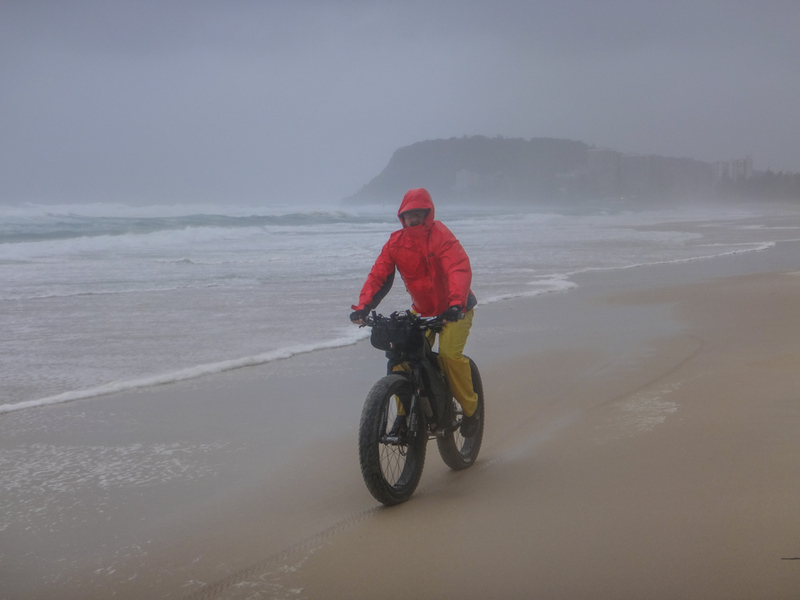 We were unable to follow the beach around the rocks, so we rode over the top of the headland instead. This was our only official climb of the day – one small headland barely ten metres above sea level. The sea raged below us as the wind roared in our ears. 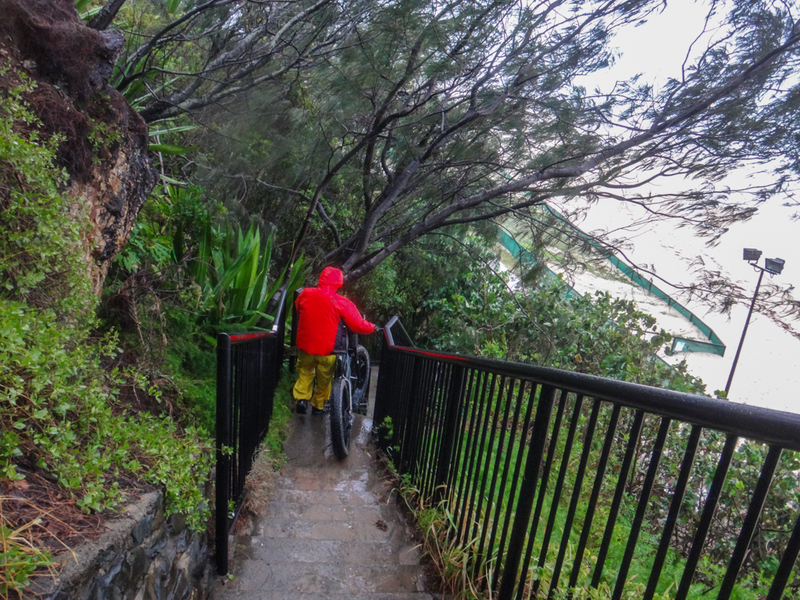 I know a few crazy riders who might have ridden down these stairs on a sunny day, but we didn’t want to tempt fate and carefully walked the bikes down to the beach. Those steps were treacherous when wet. 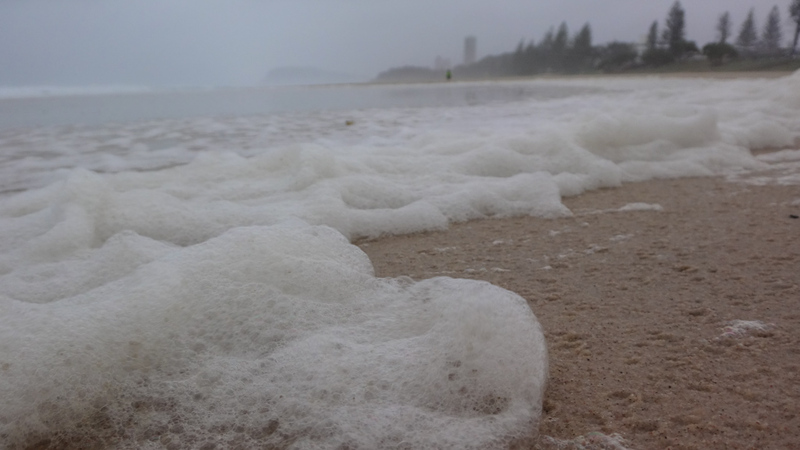 The wind whipped up foam from the wave tops and dumped it on the sand, making it look like a giant cappuccino. As it blew in from the north-east, the wind pushed the brim of my hat up against my head. 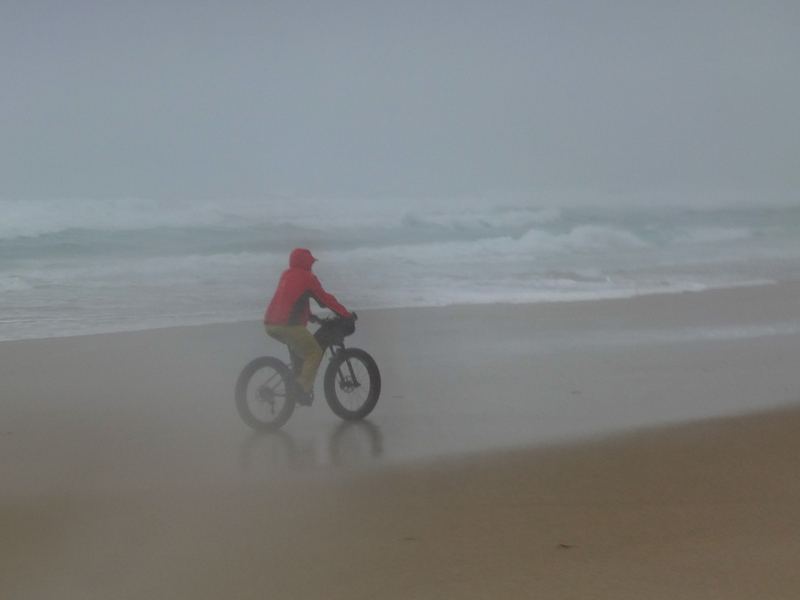 My jacket bulged out asymmetrically on my left and I subconsciously tilted the bike into the gale to keep balance. It was an unusual experience, but it seemed to work. We had the beach to ourselves. There would be no sunbathers or swimmers today. 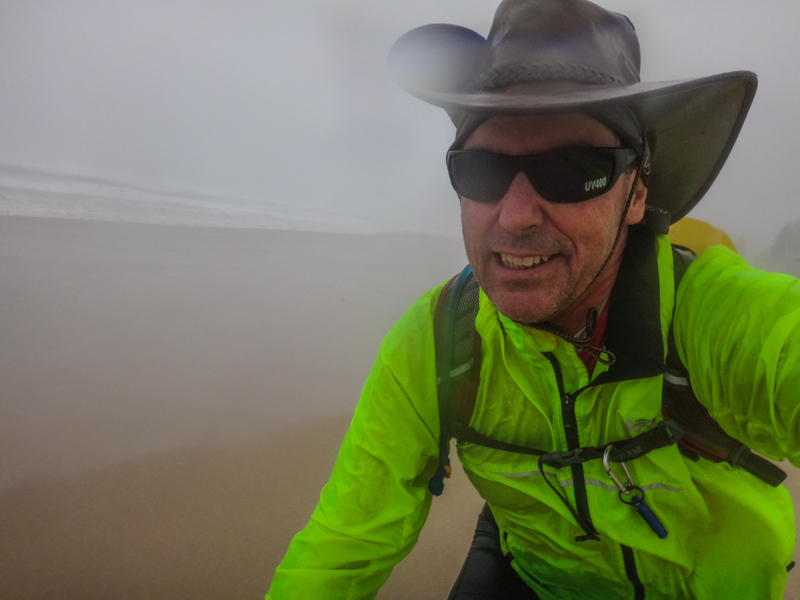 I sometimes found it difficult to pedal in the soft wet sand, and clicked the gears down as low as possible in order to keep moving up wind. The roar of the surf and the wind was deafening. Darb and I had difficulty communicating with each other at times. 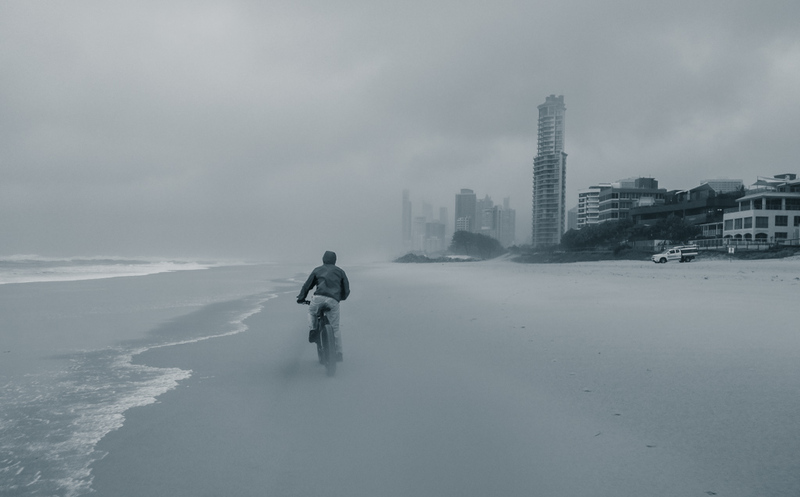 Eventually the buildings of Surfers Paradise came into view through the rain. This unusual city is built right on the beach. 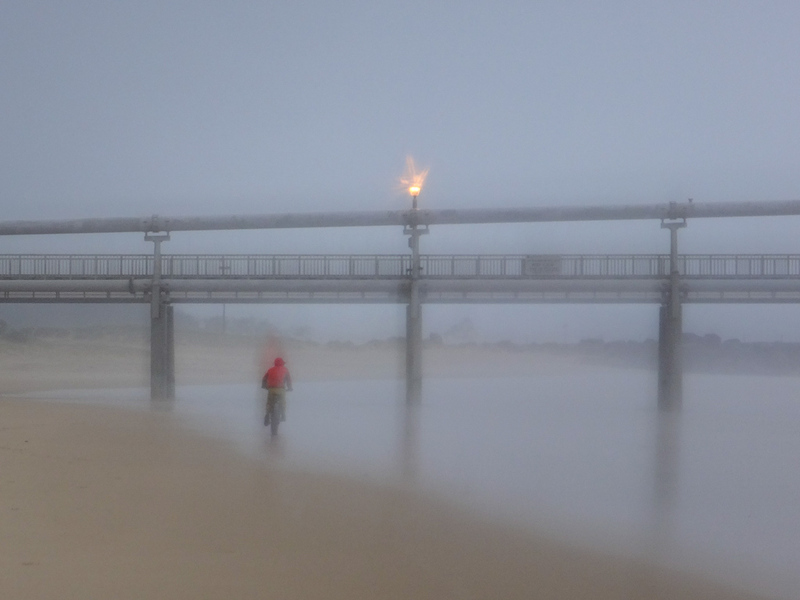 I wondered how many people were sitting snug in their apartments looking down at two crazy cyclists riding up the beach. We continued past the city skyscrapers along “The Spit” – a long finger of sand stretching north towards the mouth of the Nerang River. These are shifting sands. Around the time of European settlement in the early 19th century, the Nerang River met the ocean at Broadbeach ten kilometres to the south. 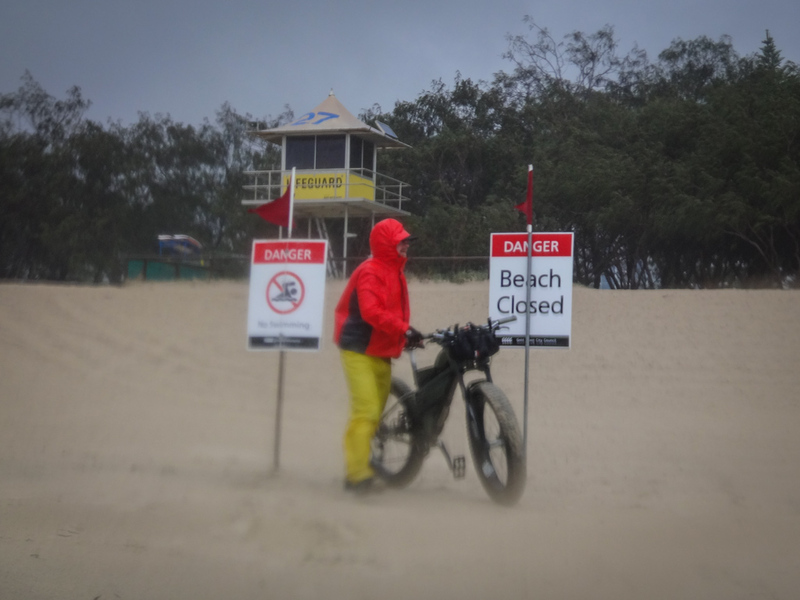 At that time, The Spit formed the southern tip of Stradbroke Island. 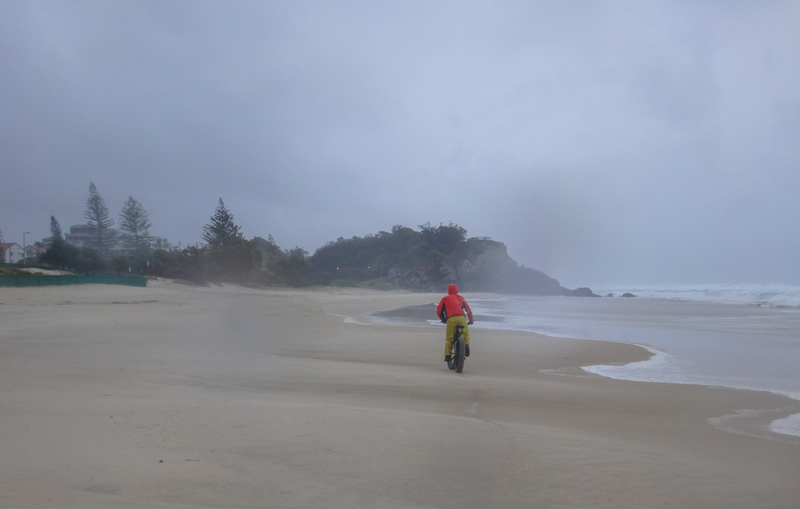 Over a period of almost two hundred years the river mouth slowly moved northwards, consuming the southern tip of Straddie, and gradually depositing the sand on The Spit. Another part of the stabilization infrastructure is this large rock wall protruding seaward from the coast along the entrance to the Nerang River. We stood at the end of the rock wall surrounded by raging waves on three sides. Waves crashed over the rocks, water stung our faces. I’ve never ridden in these sort of conditions before. It was exhilarating. What surprised me most was that the sea water felt warm. 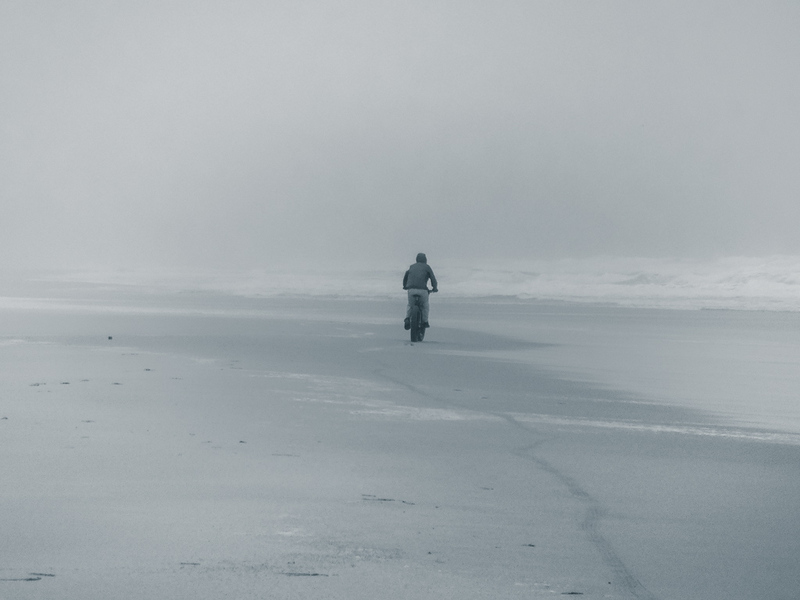 We stood in the midst of a winter storm, and the ocean didn’t feel cold at all. How strange. 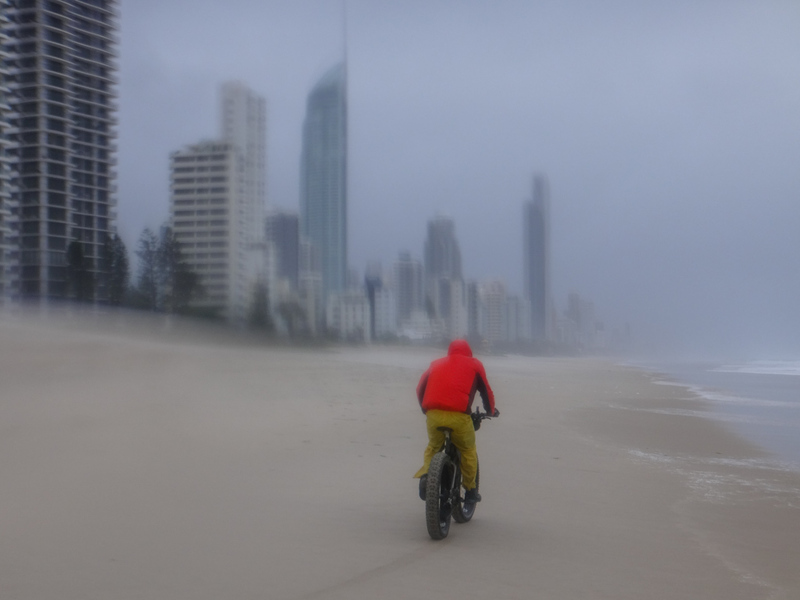 After riding eighteen kilometres up wind to the end of the beach, we finally turned our bikes around and enjoyed the “downwind” run back towards Burleigh. Unfortunately the wind wasn’t completely at our backs, and only gave us slight assistance, but it was easier going and we were able to increase our pace. The faster pace kept our tyres higher on the sand, which meant we didn’t feel as much resistance from it when the sand grew soft. So how was the wet-weather gear? Darb says his North Face coat kept the water and wind out. The hood prevented rain going down his neck and protected his head and neck from the wind. 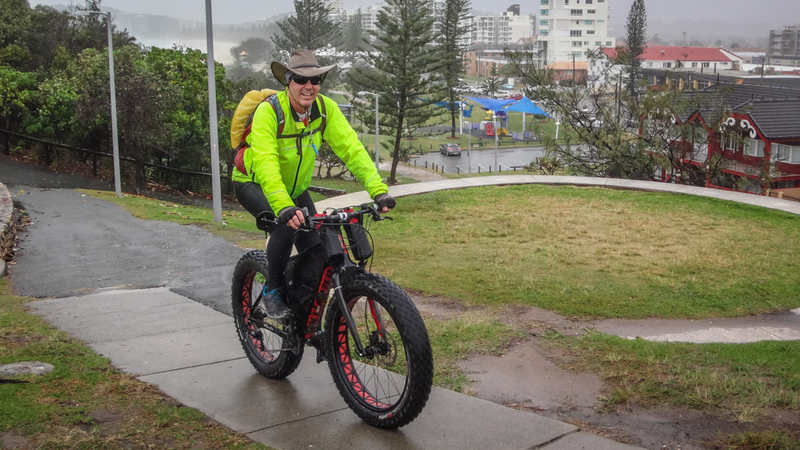 The coat wasn’t really designed for riding and flapped around in the breeze, but it comes in handy for other activities like hiking and camping. He found the Frill Neck hat bulky under the hood, but the visor worked well. It was good in cold weather but may have been too uncomfortable on a hot day. The mesh base layer and woollen jersey trapped the heat well. Even though it was cold, wet and windy, Darb was warm for the entire ride. 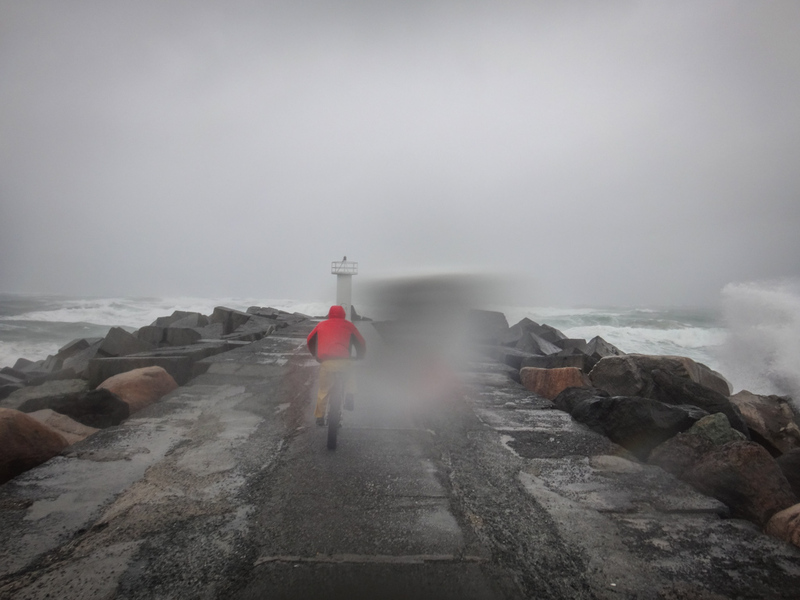 The waterproof pants had a tear in them, and leaked, but the fabric kept the wind at bay, keeping him warm for all of the ride. His Five-Ten shoes had waterproof uppers which kept the water out for a while, but it eventually the water got in and his shoes filled with water. My hat was cumbersome. It flopped around in the breeze and the brim blew up on one side where the wind hit it. Even so, it kept most of the rain out of my face, and coupled with my buff / headscarf kept my head warm. My jacket leaked water. It’s not waterproof, but it did keep the wind at bay. In conjunction with my woollen jersey and base layer it kept me warm all day. Despite the hard work, I didn’t overheat. 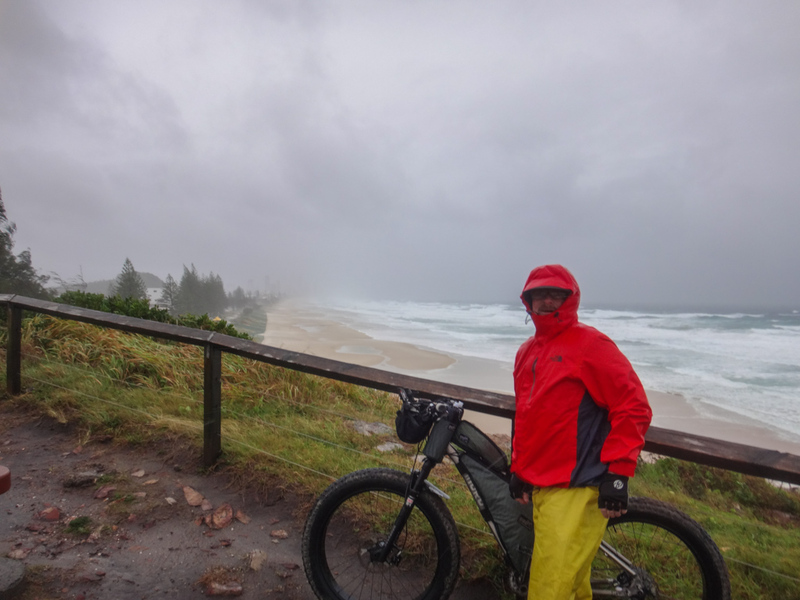 My lycra knicks and polyester leg warmers weren’t waterproof, but the fabric kept me warm. Similarly, my shoes weren’t waterproof. Rain got in, but it drained out easily too, so I was comfortable. In summary we both got saturated, but we were able to stay warm and reasonably comfortable. We rode about 36km in about three and a half hours. During that time I burned about 1,800 kcal. In pleasant weather this would be a leisurely ride on a fat bike. Today it was challenging and rates 8 out of 10 on the tough-o-meter. Thanks Darb for deciding to “turn up” with me despite the storm – but let’s try to keep dry next week, shall we? Ya mad bastards .. That is an excellent read . Thanks for a monumental effort .